I bit my nails, wrung my wrists, and chewed holes in both my cheeks while I wrapped my hungry 12-week-old tight for the 20-minute stroll. We walked slower that day, dragging each foot forward to the doom that waited ahead. 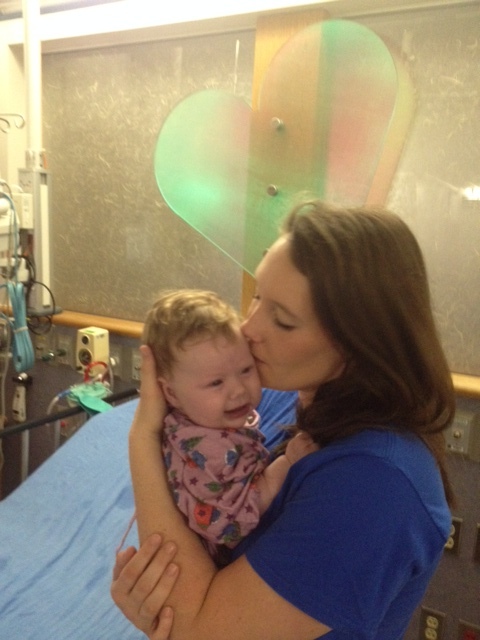 It was 4am on the morning of Annie’s second open heart surgery. Squeezing her close, lips pressed to her wavy hair, I breathed in all that was Annie. I memorized the squint of her eyes and the warmth of her tiny head cradled under my neck. I soon had the rare and unwanted privilege of administering the syringe of liquid sleep. She finally stopped fussing and sucking to rest peacefully in my arms. Her face matched the purple of the stiff hospital gown they’d dressed her in moments before. I kissed her as if it’d be my last and robotically walked the familiar halls to the surgeon’s office. We’d been quoted the prognosis weeks before. Ours was the only surgeon still willing to take a chance on Annie. Even though his skill and precision tops all the rest, he only gave us a 60% chance of seeing her again. So when we met with him that morning, we expected somber, concise conversation. A MIRACLE! When there’s not an explanation. When no one believes. When there’s hardly even a glimmer of hope. When it’s nothing any human could accomplish. What else could it be? But a year later, I worry over next time. I’m mad that we have to evaluate options of when and where and why to administer the syringe again, to meet in the surgeon’s office again, to cry and kiss our last again. I’ve forgotten to be thankful for the miracle of Annie. I’ve forgotten to live in the truth of God’s provision. I’ve forgotten to trust that provision for next time. I’ve already claimed that our miracle didn’t last long enough. So I need daily reminders! 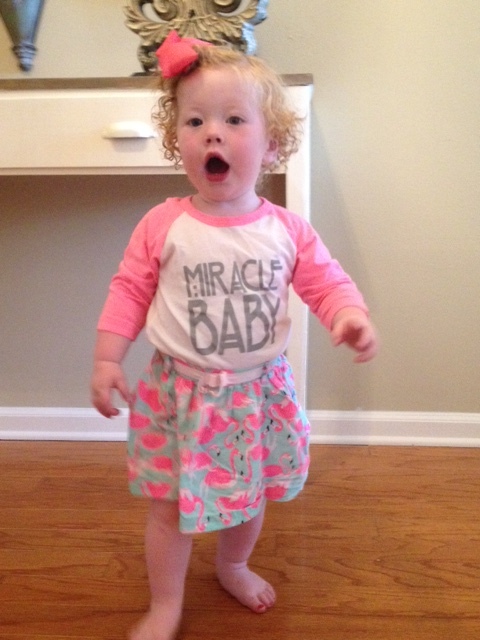 Here is Annie in her Miracle Baby Tee by Tink and Key. 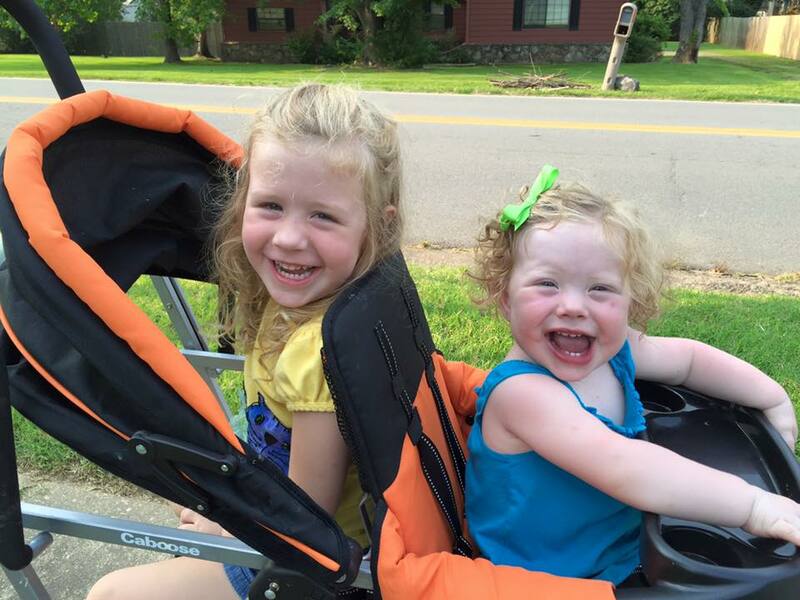 To help us celebrate the one year anniversary of Annie’s miraculous surgery, Tink and Key is offering a special coupon code JUST FOR YOU, my readers! 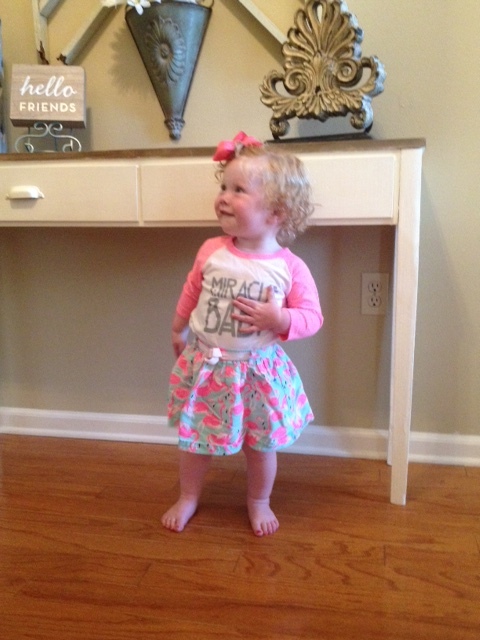 Check them out on instagram @tinkandkey, #miraclebaby, or online at tinkandkey.com. Be sure to enter coupon code SUMMERBLOG15 for your 25% discount! Over time it seems that our once-in-a-lifetime miracles become everyday expectations. 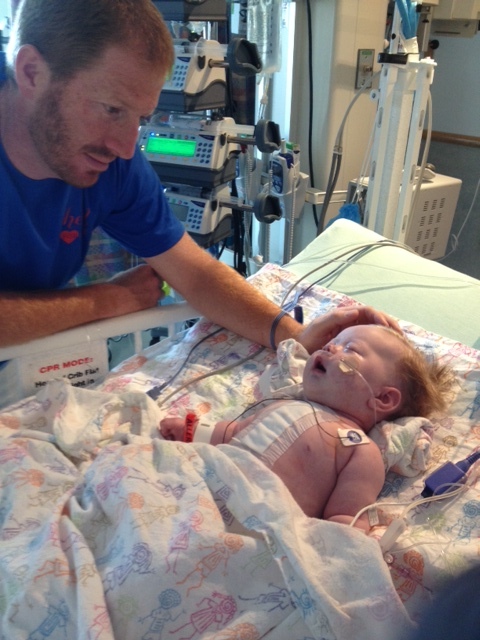 I want to stop asking, “Lord, what will you do for me next time?” and start finding joy in the miracle of Annie’s life every single day. It wasn’t meant the way it sounds, but it was a sharp reminder of the curiosity that Annie is bound to face as she grows. 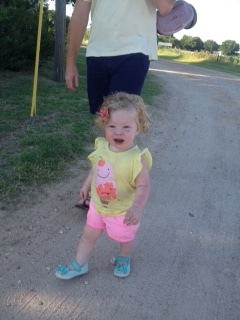 It’s hard to be labeled “sick” when she’s a taller, fatter, and faster talker, walker, lover than everyone else her age. But for your own protection, I have to admit that Annie is certainly contagious. Not one person yet has ever witnessed her plum lips split into a wide, open-mouthed smile and resisted smiling back. 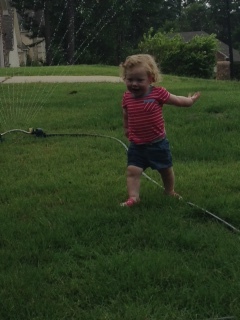 I can only hope that I catch a little bit of her free spirit darting in and out of the sprinklers, squealing loudly enough for her doctors in Philly to hear. She’s quite the crowd pleaser with her silly antics. 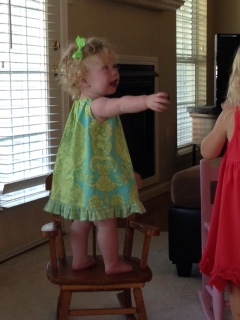 This itty bitty knows what’s funny and she’s always out to elicit a laugh. She’s friendly and engaging, already practicing good Southern etiquette of speaking to each person she encounters with a confident wave across the restaurant and a loud “Bawww” and a blown kiss when someone goes on his way. But don’t worry, no germs travel from her kiss through the air to you, so you’re still safe! 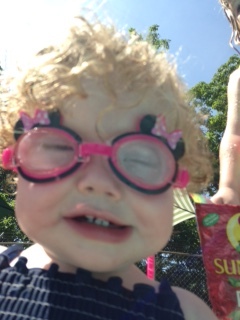 She lives each day so full of “ba-bees” (babies), “mil, mil” (milk), “momma, dadda, sisttt-der” (sister), “Pa” (her favorite uncle Paul), swimming, sliding, dancing, singing, coloring, play-dohing, hugging, kissing, building, learning, and growing that she’s easily brave enough–or at least tired enough–to sleep on her own in the toddler bed. Often still in her clothes! 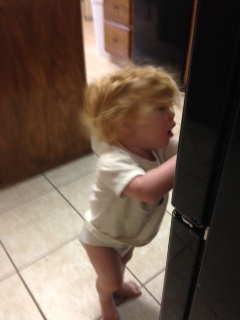 How is she SO BIG already? 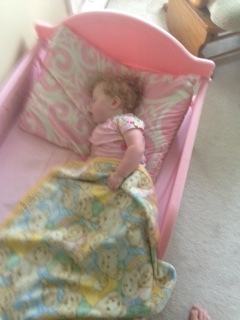 Big sister needs to catch some of that sleep-on-your-own courage! And, honestly, we could all just hope and pray that something about her hair’s amazing volume could be easily shared with us! Right? 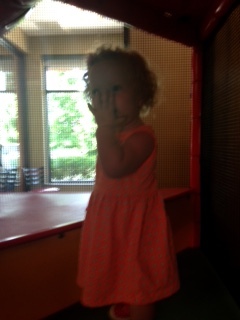 She didn’t get it from me! So yes, thankfully Annie is contagious. Unfortunately, though, I don’t know if Annie will die soon. It sure doesn’t look like it to me and we currently have no reason to be concerned. It’s a fair question, though, he asked as he continued, “But she only has half of a heart!” And it’s true, someone shouldn’t live with only half of a heart. But thankfully by God’s provision (and oils, which are totally God’s practical provision) our Annie is doing it…and you’d be lucky to catch a little something from her!